KINSHOFER released the RBS, RBS20 and RBS20HPX, railway tie/sleeper changer attachments for efficient railway maintenance and repair. The attachments can be used with 12- to 24-ton rail excavators to quickly exchange existing concrete and wooden ties without disrupting the track. The attachments’ large shields allow operators to easily clear ballast from the tracks, and after the new tie is placed, quickly backfill and level the ballast. The RBS comes standard with a Nordic s-style coupler adapter. The attachment is capable of continuous 360° rotation and multi-directional tilting up to 55° when paired with KINSHOFER’s NOX-Tiltrotator. The RBS20 can switch from handling standard mono-block ties to bi-block ties with no modification, thanks to internally and externally fitted pads. It offers removable bolt-on ballast buckets and the ability to handle bi-block ties. 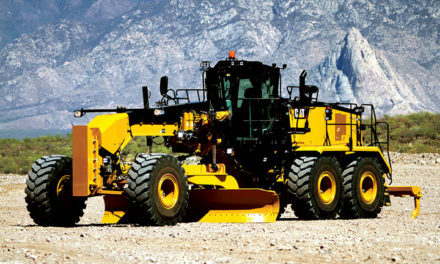 The RBS20HPX adds KINSHOFER’s low-maintenance HPX cylinderless drive with exchangeable shell system for the gripping unit, which achieves 25% greater power than traditional cylinder-driven attachments. All three attachments operate on a 2,880-psi hydraulic circuit. The RBS20 and RBS20HPX require a second, 5,040-psi hydraulic circuit to power the 15-ton rotator.